An intriguing aspect of this project was fitting the portal concept of the logo into the main navigation. The four portals of the logo were created to mimic the brick and mortar store set-up. These ‘boutiques’ or ‘portals’ give the user two ways to navigate the site - directly using categories or indirectly by exploring a boutique’s unique grouping of products. Using a palette that matched the logo’s many colors while accommodating a wide range of fabric swatch colors was another consideration in choosing the a more minimalist palette. Homepage Flash modules showcase rotating content to keep the site fresh. Below the homepage's fold, we took a tabbed approach to showcasing layers of dynamic content. On the interior portal pages, the colors orange, purple, blue, and green were used to set these pages apart. Hero art showcased featured content and a quad area demonstrates another way to bring the subcategories up. An intriguing aspect of this project was translating the idea of "boutiques" into the main navigation. Four distinct 'boutiques' (Style Studio, Cotton Loft, Decorator Gallery, Accessory Workshop) can be found in the brick and mortar stores and this had to be conveyed in the navigation. This required extensive rework of the entire product taxonomy so that all products would fit under these categories in a logical way. These ‘boutiques’ or ‘portals’ give the user two ways to navigate the site and explore products - directly using categories or indirectly by exploring a boutique’s unique grouping of products. Using a palette that matched the logo’s many colors while accommodating a wide range of fabric swatch colors was another consideration in choosing a more minimalist palette. Above the fold, homepage Flash modules showcase rotating content to keep the site fresh. Below the fold, we took a tabbed approach to showcasing layers of dynamic content. An intriguing aspect of this project was fitting the portal concept of the logo into the main navigation. The four portals of the logo were created to mimic the brick and mortar store set-up. 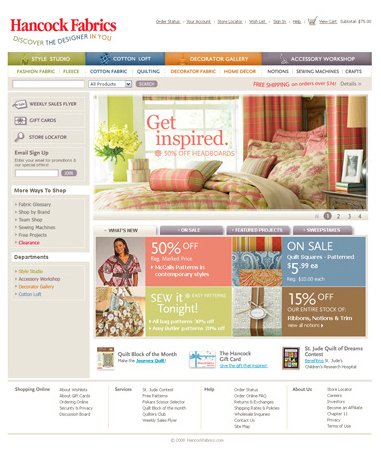 These ‘boutiques’ or ‘portals’ give the user two ways to navigate the site - directly using categories or indirectly by exploring a boutique’s unique grouping of products. Using a palette that matched the logo’s many colors while accommodating a wide range of fabric swatch colors was another consideration in choosing the a more minimalist palette. On the interior pages, "hero" art (large photo as main focal point) showcases featured content. A "quad" area demonstrates another way to further highlight and promote important fabric subcategories. 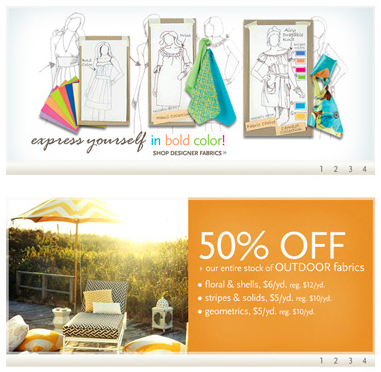 The above thumbnails display the landing pages for individual 'boutiques' or 'portal stores' within the site. The tab for each store pops up when the user navigates to that store, appearing higher than the rest of the main navigation. These interior 'portal pages' as they are called, are color coded to match the navigation. 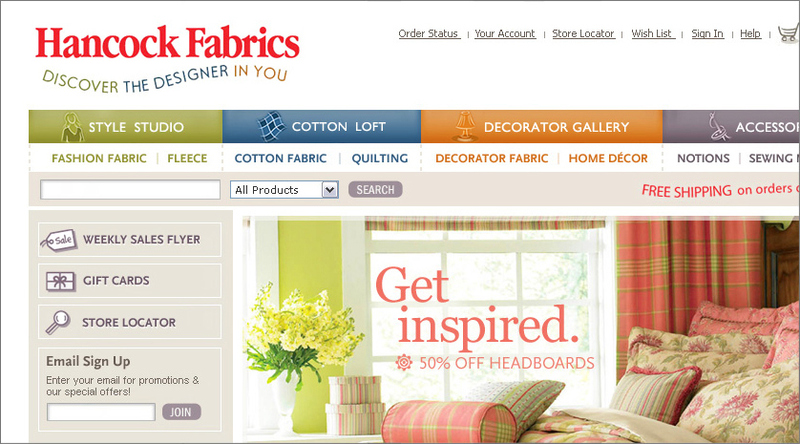 The product subpages that fall under these top-level portal pages are color coded in either green, blue, orange, or purple as well, to match the section of the store they live in. 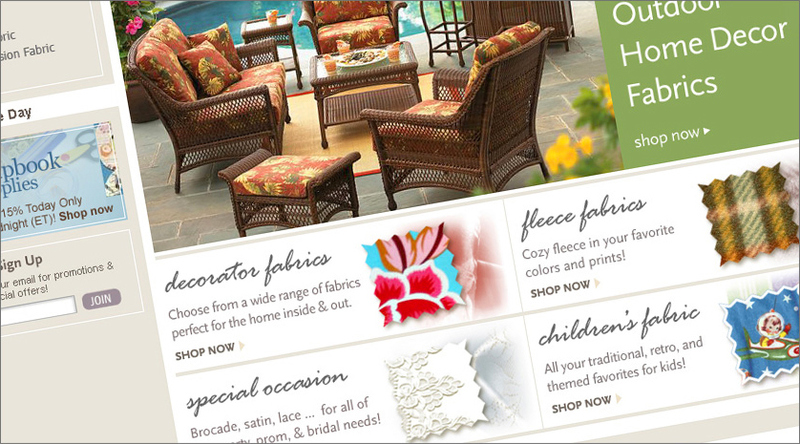 Sample homepage Flash modules are used to promote sale items and other scrumptious product offerings.